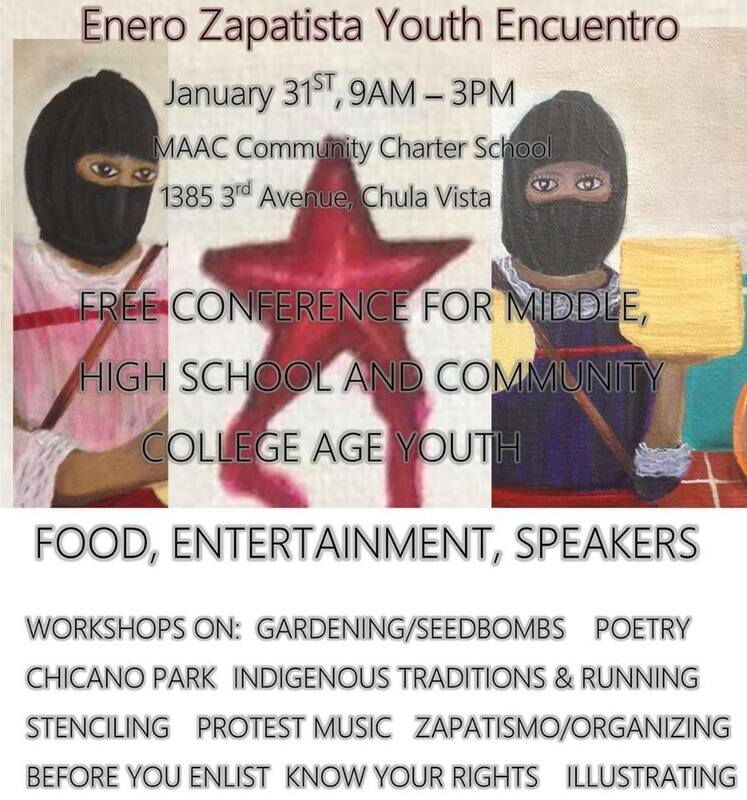 It’s that time of the year again – the 11th annual Enero Zapatista is only 2 months away! The closing event will be at the Centro Cultural de la Raza in Balboa Park on Saturday, January 31, and as always, we are looking for inspiring art to fill the gallery. We encourage you to submit an art piece for the closing event of Enero Zapatista 2015! The exhibition theme is “Intersectionality: Identities as Resistance”. Many of us carry multiple identities– some of these identities have been assigned to us, some have been chosen by us and some have been reclaimed as part of our resistance against a system that attempts to fragment us and exploit our differences. We envision this exhibition being one that celebrates our differences without dismissing them. What intersectional identities do you carry? The artwork will be installed in the gallery at the Centro Cultural de la Raza. Each artist is required to fill outthis exhibition form in order to participate. The form needs to be submitted by January 4, 2015. The artwork needs to be dropped off between January 6th-January 8th between 6-8pm at the Centro Cultural de la Raza. If these dates and times do not work for you, please contact the committee to schedule a time to drop off your artwork. Please have the artwork ready to hang! If you don’t like or can’t use Google forms (Google is evil, after all), you can send an email to enerozapatistasd at gmail dot com, copy and paste the questions from this PDF to the email, answer them and send it to us. If you need additional info or have more questions, please send us an email. Looking forward to another amazing Enero! Se les invita a mostrar una obra de arte inspirada por el Zapatismo para el evento de clausura de Enero Zapatista 2015. El tema de este año es “Interseccsionalidad: Identidades como Resistencia.” Much@s de nosotr@s tenemos múltiples identidades- algunas de estas se nos han dado, unas las hemos escojido y otras reclamadas como parte de nuestra resistencia del sistema que intenta fragmentarn@s y explotar nuestras diferencias. Las obras se instalarán en la galería del Centro Cultural de la Raza. Se requiere que cada artista llene este formulario de exposiciones para participar. El formulario debe ser entregado para el 4 de enero, 2015. La obra de arte debe ser entregada entre el 6 y 8 de Enero durante las 6PM a 8PM en el Centro Cultural de la Raza. 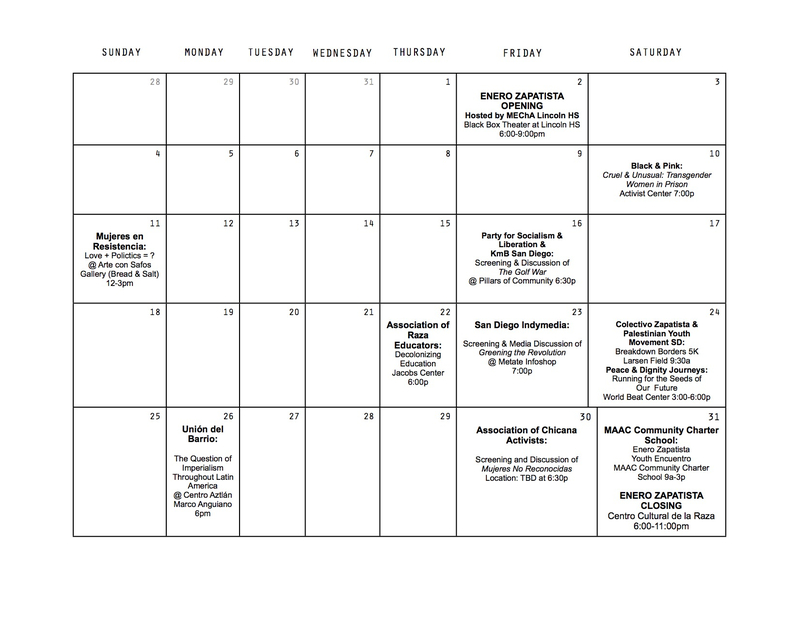 Si estas fechas y horario no le funcionan, favor de comunicarse con el comite de enero zapatista para coordinar otro horario. Favor de tener la obra lista para colgar. Si no te gusta o no puedes usar a formas de Google (Google es del infierno, de todas formas), existe la opcion de mandar un correo a enerozapatistasd at gmail dot com, copiar y pegar las preguntas de este PDF, contestarlas y mandarlo a nosotros. Si ocupas mas informacion o tienes mas preguntas, por favor, mandanos un correo. Esperando con anticipacion a otro Enero increible! 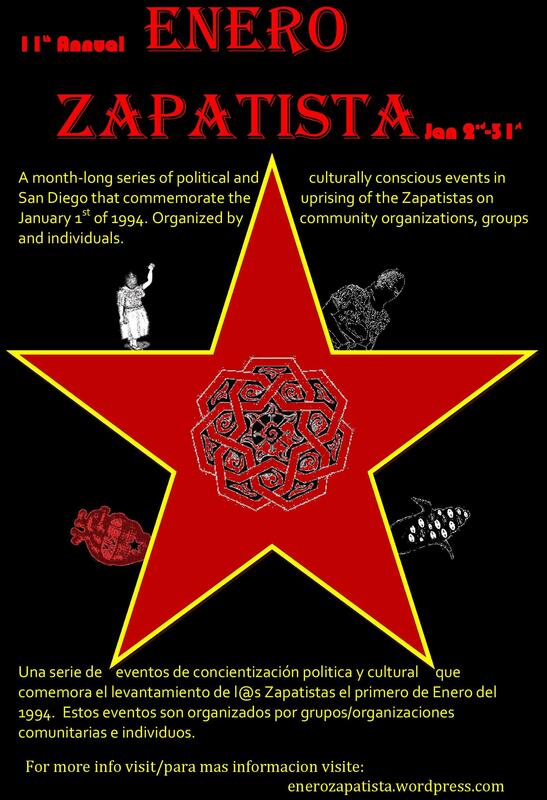 Please join us for the celebration of the 11th Annual Enero Zapatista, a month-long series of events. We will host the opening event on Friday, January 2nd, 2015 from 6:00pm – 9:15pm at Lincoln High School, in the Blackbox Theater (4777 Imperial Avenue, San Diego, CA. 92113). We will begin by breaking bread together and partaking in a community potluck. After sharing food together, there will be a screening of several short films that address various community struggles and concerns. Shortly after watching the films, we will engage in an open dialogue and discuss these issues with members of our community.This event is the first of a month-long series of events that commemorate and celebrate the Zapatista uprising of 1994. **There will be food, music, and good conversation! **Community organizations will be tabling with information about the work that they do and possibly selling some dope merchandise! THIS EVENT IS BEING HOSTED BY LINCOLN MEChA. 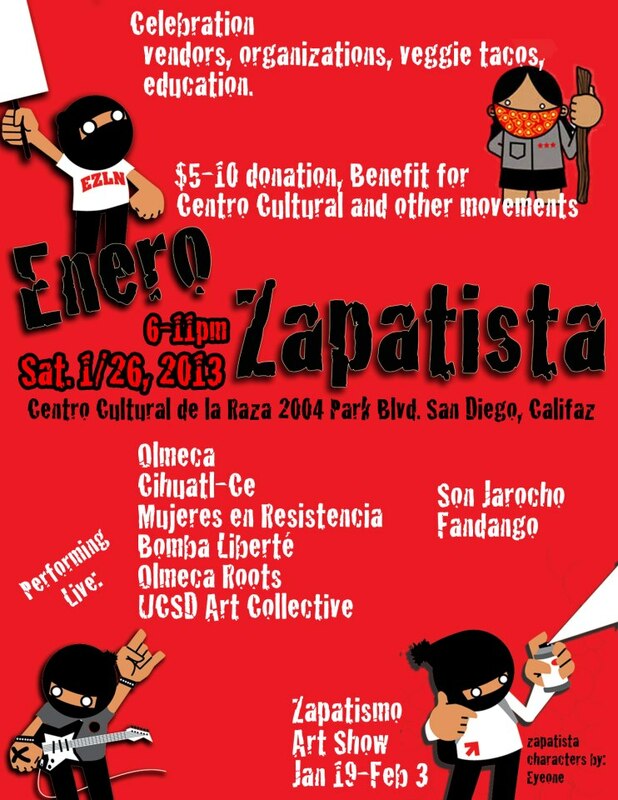 This is the last event of Enero Zapatista. There will be Art, Food (veggie taquiza), Vendors, and performances by Olmeca, Mujeres En Resistencia, Cihuatl Ce, and more! Come join us for this celebration.